The basic idea of the method is to solve the entire cube from here by just turning the 2 free sides. But if you try to do that, you soon discover that some edges are always twisted the wrong way. We call those the "bad" edges. We need to fix that before we move on. Step 3 is this fix. Step 3 can seem incomprehensible before you "get" it, but it is really the simplest step in the method. If you don't like the beginner instructions, take a look at the intermediate ones. You may like that approach more. Basically, we need to do 2 things in step 3. 1. Identify the bad edges. There are 7 edges not part of the 2x2x3. Pick any one of them, say the red/blue one. Using only the 2 free layers (that is, not breaking up the 2x2x3), place it between the red and blue center pieces. If it's twisted right, it's good. Otherwise it's bad. That's all. Make a (mental or on paper) note of it, and check the next edge. When checking the second and later edges, do not try to keep the previous edges in place. It is not only extremely difficult, but also completely unnecessary. Once you know if an edge is good or bad, you know. 2. Turn bad edges into good edges. There are always an even number of bad edges. You can make them good in pairs. The simplest way is the 3 move sequence shown to the right. Just place two bad edges in the positions of the colored edges, and do it. Check that your edges actually became good the first times, to be sure you're doing it right. Continue until you're sure all edges are good. 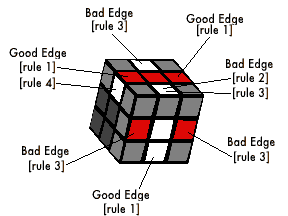 Since we only want to know if an edge would be correctly twisted if it was placed in its correct location, we don't have to waste moves actually moving it there. An edge with an A color sticker next to the A color center is good. An edge with an A color sticker away from the A color center is bad. An edge with a B color sticker next to the A color center is bad. An edge with a B color sticker away from the A color center is good. The usual advice applies in step 3 as well: Look ahead, and try to make a good beginning for the next step. Why does the move sequence in the animation above work? It's not just a "magic move". You can understand it. What happens is  one bad edge is flipped when moved to the other layer,  another bad edge replaces it, and is  (un)flipped when the first turn is reversed. Both edges get flipped in the process and so become good. Once you understand that, you can figure out several other moves that do the same thing. I find that way of thinking much easier than just learning all cases by heart. However you want to learn them, every possible case is given the fastest solution in the links below.